Kinston-Joyce Robinson Taylor, 77, peacefully transitioned to her Heavenly home on Tuesday, November 20, 2018. Joyce was born April 22, 1941, in Sampson County to the late Wilbert Elliot Robinson and Edna Earl Flowers Robinson. Blessed with the sweetest spirit, Joyce’s warm smile and great hugs endeared her to everyone she met on her life journey. Her loving and caring ways made everyone think of her as their Mema. Joyce’s love for her Lord radiated out in bright glory. Her faith in her Lord and concern for others was exhibited in all she did. A true prayer warrior, Joyce was passionate about her belief in Jesus. She was a lady of great faith and was always in the scriptures to deepen her faith. 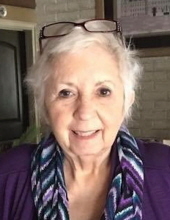 Joyce was a faithful member of Groundbreakers Ministries. Joyce’s greatest accomplishment and treasure was her family. As a mother and grandmother she was the perfect role model. Mema’s caring ways, gentle hugs, bright smile, words of wisdom and her courage in times of crisis are cherished by her family. A service to celebrate Mema’s life will be held Sunday, November 25, 2018 at 3 p.m. at Groundbreakers Ministries. Graveside committal services will be held Monday, November 26, 2018 at 11 a.m. at Pinelawn Memorial Park. Joyce is survived by her daughter, Rev. Sherri Ezzell and husband, Leon; son, Ralph Charles “Chuck” Taylor, Jr. and wife, Deniseana; four grandchildren, Christian Taylor Elliott Smith, Taylor Leigh Ezzell, Charles Alencar Taylor, and Liliana Alencar Taylor; special cousin, Donna Robinson Raynor; and her beloved canine companion, Bindi. In addition to her parents, Joyce was preceded in death by a brother, Lynwood Robinson. Family and friends will be received Sunday following the service. Online condolences may be expressed at www.rousefh.com. Joyce’s family would like to extend a special thank you to Pruitt Health for their loving care and support. Words don’t begin to express our gratitude. Memorials in Joyce’s memory may be made to Groundbreakers Ministries, 2600 West Vernon Avenue, Kinston, NC 28504. Arrangements have been entrusted to Rouse Funeral Home, La Grange. To send flowers or a remembrance gift to the family of Joyce Robinson Taylor, please visit our Tribute Store. "Email Address" would like to share the life celebration of Joyce Robinson Taylor. Click on the "link" to go to share a favorite memory or leave a condolence message for the family.